Danny & The Champions Of The World, Magic Numbers, Indigo Moss @ The Windmill, 14th Dec.
After sitting two rows from the back of the Festival Hall a couple of weeks ago, it makes a change to be little more than an arm's length from the band this time. In fact, drummer Sean Gannon is a no-show but we still get a lively run through some of their well-known tracks (if I remember right: "Long Legs", "Love's A Game", "Take A Chance" and "Love Me Like You") as well as the more obscure "Tonight" (which they sang with the Smoke Fairies at the RFH). Quite a big deal to see a major act in such an intimate venue. - Indigo Moss, who I heard a few months ago performing on the Queen Elizabeth Hall roof. Lively country/rockabilly tunes, all fiddle, banjo and harmonica, is their stock in trade but one song in particular took my ear, the much more downbeat "Swimming". Shades of Natalie Merchant, I think. Definitely gets the nod as this week's "best song ever". - Bringing up the rear, Danny & The Champions Of The World were worth hearing too: quite impressive visually, with their face-painted eight-strong line-up, and with some interesting instrumentation (trumpet, violin, sitar). 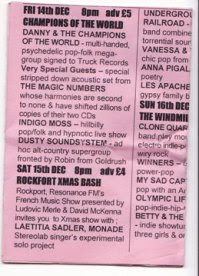 "Time Out" puts them in the "psychedelic pop folkies" pigeon hole and that's probably fair enough. I thought the singing of the main man--"Danny" presumably--had a bit of early Neil Young to it.